CHICAGO -- Playing four games in five nights didn't appear to be a problem for the Atlanta Hawks. Not when Al Horford was having a career performance. The 6-foot-10, 250-pound center notched his first career triple-double on Tuesday and the Atlanta Hawks streaked to their ninth consecutive win following a 105-87 victory over the Philadelphia 76ers at the Wells Fargo Center. "I was close before. 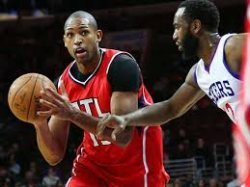 I'm happy I got it," the 29-year old Horford told ESPN after achieving a career milestone with 21 points, 10 rebounds and 10 assists. Kent Bazemore added 17 points and Dennis Schroder chipped in 13 points and six assists for the Hawks, who have now won 23 of their last 25 games, including nine straight on the road. Atlanta, which currently leads the Eastern Conference with a 30-8 record, made 42 of 87 field goals and 11 of 23 triples. The Hawks jumped on the hapless Sixers 25-10 in the first quarter before stretching the lead to 74-53 with 48 ticks left in the third quarter. Photo: Al Horford's (L) triple-double carried the Atlanta Hawks to their 9th straight win, beating the Sixers, 105-87, on Tuesday night.